Girls in a Isaan style musical act wait to go on stage at the Rattanakosin Festival on Sanam Luang. Bangkok is celebrating its 232nd anniversary this weekend. It's a baby compared to the other great cities of the world like London, Paris or Madrid. Even compared to New World cities like New York and Mexico City it's just a toddler. What Bangkok lacks in historical presence though it more than makes up for in energy. Although there's been a presence in Bangkok since the 15th century, the place that is now Bangkok was little more than a wide spot in the Chao Phraya River until 1782, when Buddha Yodfa Chulaloke, better known as Rama I, the founder of the Chakri Dynasty (which stills reigns, Bhumibol Adulyadej, the current King of Thailand, is Rama IX) moved the capital of Siam (now Thailand) across the river from Thonburi to Bangkok. A Thai martial arts demonstration at the Rattanakosin Festival. Now Bangkok is one of the most dynamic cities in the world. Thais don't call Bangkok Bangkok, that's just what foreigners call it. Thais call it Krung Thep Maha Nakhon. The city's full official name, used in ceremonies is: Krungthepmahanakhon Amonrattanakosin Mahintharayutthaya Mahadilokphop Noppharatratchathaniburirom Udomratchaniwetmahasathan Amonphimanawatansathit Sakkathattiyawitsanukamprasit (I can't pronounce it either). Translated out of Thai, it's: "City of angels, great city of immortals, magnificent city of the nine gems, seat of the king, city of royal palaces, home of gods incarnate, erected by Visvakarman at Indra's behest." But Thais just call it the Krung Thep for short. 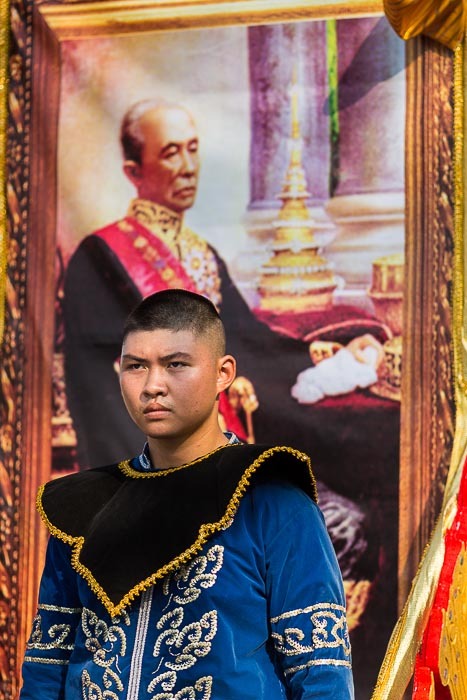 A young man stands in front of a portrait of Rama IV, the great King Mongkut, one of the most revered of the Chakri Kings. He brought a number of innovations to Thailand and maintained Siam's independence at a time when neighboring Cambodia and Burma were being carved up by French and British colonizers. The Ministry of Culture is throwing a party on Sanam Luang this year marking 232 years of Bangkok. Although it's supposed to be Bangkok's birthday party, it's really a celebration of Thailand's diversity. From the songbirds of southern Thailand to the foods of Isaan, you can virtually tour Thailand by walking around Sanam Luang. It was a great way to spend a Saturday afternoon. 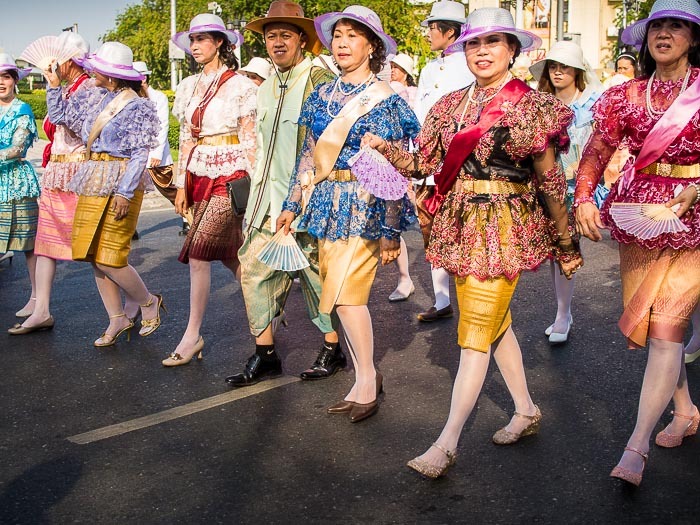 People in traditional Thai attire (except for the hats) walk around Sanam Luang during a parade honoring Bangkok. There are more photos of the Bangkok fete in my archive or available from ZUMA Press.